15 Ways to Make Money Online Internationally – Work Online and Travel! Are you looking for ways to make money from home but don’t know where to start? I get it! Sometimes, it feels like an impossible dream, to be able to reduce or eliminate your commute and have more time with your family. Working online from home or while travelling is possible, especially if you’re prepared to try new things. Since my entire income for the last two years is from making money online from anywhere we were including New Zealand, Ireland, Mexico, Spain, Singapore and all the places we travelled in between, I wanted to give you a helpful list of ways to make money online from where ever you are. A quick note: You might be wondering how to make money online internationally, especially if you’re in a country with a small economy (like me in New Zealand). Think about targeting customers and clients from other countries. In fact, there has never been an easier time to earn money online from anywhere in the world. If you’d like to earn an income online, here are some surefire ways to get started, whether you’re in Texas or Taipei. Watching videos online from your phone or computer is a great way to make money online fast with Swagbucks. If you’re in North America, U.K., Ireland or Australia you can join Swagbucks for free, and get a FREE $5 credit with this link. One of the easiest online money making ideas is taking paid surveys with Survey Junkie. Survey Junkie is open to participants from the United States, Canada and Australia. Join Survey Junkie today. MySurvey, VIP Voice, Opinion Outpost and Pinecone Research are legit American survey sites to make extra money. In Canada check out Ipsos Panel, Pinecone Research, Web Perspective and Mobile Xpression. Click here to read how mum blogger, Emily, makes over £100 per month taking online surveys in the UK. In Ireland, I recommend Irish Opinions and MySurvey. Find more Irish paid survey options here. OpinionWorld NZ , Valued Opinions and Toluna Opinions are my top rated NZ surveys. I’ve written more about the best paid online surveys in New Zealand here. The best thing about doing surveys online is you can earn money and gift cards while sitting on the couch, or waiting for the kids to finish school. One of the easiest ways to make money from home or abroad is to become a virtual assistant. A virtual assistant can offer any number of services, depending on experience. 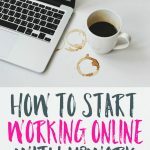 If you’ve worked in administration or as a personal or executive assistant, starting a virtual assistant business could be the easiest way for you to start making money online. Starting a virtual assistant business is especially great for those of you who have wondered how to make money online without paying anything towards fees or memberships as you can easily promote your virtual assistant services via free platforms such as LinkedIn. What is drop shipping, you ask? Drop shipping is when you sell a product online, without holding inventory. When your customer places an order, that order is then fulfilled by a drop shipper, who holds the stock and organises shipping. As you can probably imagine, holding stock would be quite limiting if you want to travel the world whilst running your business. Most drop shippers start out by opening a store on eBay, so it can be a very cost-effective business to break into. To be successful as a drop shipper, you’ll need to have a website, a marketing plan and in-depth knowledge of your chosen product. I recommend checking out this super-useful guide to drop shipping from Salehoo, to see if drop shipping will be a good fit for you. Up until a few months ago, a large portion of the money I earnt online came from freelance writing. Freelance writing is a great way to earn money online from home or when travelling. Writers can make a legit income writing articles for blogs and businesses. Although I didn’t have any formal experience as a freelance writer, I used my blog as a portfolio, set up a profile on Upwork, and within a few weeks, I had my first gig. I have some more tips on how to get started with Upwork here. Offering a service from home is the simplest way to get started making money online. Are you exceptionally skilled in your industry? Have a skill set that commands a high rate? Could you work remotely? This is exactly what I did when I was first looking for ways to work online from home. I used my professional experience and network to set up a marketing business. Former colleagues became clients through word of mouth. I set my hourly rate at something I would be happy with but also provided value to the client. I have never once advertised, and work keeps coming my way. Some ideas that work well for a service business are website design, bookkeeping, database administration, marketing strategist. If you have a lot of time before you need to start making an income, blogging is an excellent way to make money online. How do I know? Well, I make over $3000USD per month from my blog (my picks for the best courses on blogging here) and my income grows every month. Blogging income comes from many different sources including sponsorships, affiliate marketing (read more below), advertising income, course sales and more. At last count, my blog had 8 income streams which pay me each month. The great thing about a blog is how easy and cheap they are to start off. I have been blogging since 2013 but only started to think about making money from a blog in early 2016. I have invested thousands into courses on blogging and still have loads to learn. If you need income right away, blogging is not the answer. BUT, it’s a fun way to connect with people who have the same interests as you and actively practice writing. Update: I’m now making over $100 a day from my blog and other websites, read more about that here. Affiliate Marketing is when you promote a product on a website or by social media and receive a commission on any sales made from your referral. It can be a lucrative business to make money through internet marketing but you’ll need to grow an audience of potential purchasers first, which means affiliate marketing can take a long time. Many people also start niche sites based on certain products, aiming to exploit affiliate revenue by providing detailed reviews and information about products. Are you crafty or creative? If so, you could start a business selling your wares on Etsy. Etsy is an online marketplace for crafts, handmade and digital goods. You will need to consider shipping costs for overseas customers, but there is definitely good money to be made. Have a read of this article from Mr Money Mustache about his wife’s soap making business, it’s very informative. CSR’s (Customer Service Representatives) are the most commonly occurring jobs under Seek’s Work From Home listings in New Zealand and Australia. If you’ve got excellent spoken English and experience, working from home as a CSR is one of the simplest transitions to make as most employers will provide you with the full setup from home. You can earn money from home in NZ or in loads of other countries by testing other people’s website. You’ll earn $10USD per 20-minute test. You’ll need a good internet connection and very clear spoken English. User testers provide valuable feedback to website owners about website navigation and use. Click here to read more about becoming a user tester. Proofreading is becoming a more popular way to make money from home. If you have an excellent eye for detail, becoming a proofreader is a business you can do from anywhere. Love music? Record companies and indie publishers appreciate feedback before going to market with new music. Check out slice the pie to be rewarded for sharing your opinions on new music before it hits the charts. This article was written in collaboration with Salehoo. All opinions are my own. First Kiwi blogger I have come across to be honest and I’m sure there are plenty more out there however you are the first for me. Awesome suggestions, I had many problems with the survey sites though. And how do you get the blog moving? like how do people find the website? Some survey sites are super dodgy. I stay the hell away from those. As for traffic, Pinterest is awesome for bloggers getting started. Search engine traffic is the ultimate goal, but that’s harder to achieve on a new blog. Definitely look into Pinterest for blog traffic. Just wondering how you get paid for some of your sites. Do you have to have an international bank account for overseas transactions? I am in New Zealand. Thanks. Hi Deb. I receive most of my payments by Paypal, some with Payoneer and a few who pay a wire transfer into my New Zealand bank account. My accounts are all over the place really. I think that’s just the nature of this game when you don’t live in the USA. Hello I want to start making money through the internet. Can I start any of this listed above from Ethiopia? Hi Asme, yes definitely. I’m not sure about the survey sites but you could definitely start working as a virtual assistant or a freelance writer depending on your skillset. If you have a good internet connection, there’s no reason why you couldn’t work online. Check out Upwork to get started. Good luck! Im from Fiji . For a quiet some time , Ive been researching on this topic, how to make money online but couldn;’t be able to start as I find out some are not true as they claim and some other issues ,like only offer in some countries . Can you help me get started and which site I should pursue . Thank You . Bula Miliana. You’re right, a lot of online income opportunities only work in some countries. Paid surveys etc. But I believe you can still access sites like Upwork and the like? If so, starting a service based business could be a good way to start an online business. I’m not sure what your skills are but if you have administration skills or know how to use WordPress, you could become a virtual assistant. The pay rates vary (but I think a beginner virtual assistant with good skills would earn at least $5/USD per hour and I know some VAs who earn over $25USD/hr when they are experienced and have a good client base). If you don’t have admin skills, there are lots of free courses on sites like open2study, Lynda.com, skillshare etc, where you could learn these tasks.